You are here: Home / Tips and Advice / How to avoid Epson L800 Waste Ink Pad Overflow? The users who use the Epson L800 Printer series all have the problem while the printing process is happening, this problem called Waste Ink Counter Overflowed. The manufacturers produced the Epson printers with an important component called Waste Ink Counter. This is used to calculate the number of waste ink during printing procedure. After a long period of printing documents, the Waste Ink Counter will gradually raise up from 0% to 100%. The printer will stop printing immediately when this case happens to avoid the waste ink overflowing, the printers can send you the signals of this error such as the red lights blinking as well as the message on the screen: “The Printer’s Ink Pads are at the end of Their service life. Please contact Epson Support”. You can find the application that is provided by us on the formal website, this software called WIC RESET TOOL has the function to reset the Waste Ink Counter back to 0%, you can reset Epson L800 printer’s Waste Ink Counter by yourself based on the solution on the website, when the resetting is complete, your printer can continuously work. Moreover, you need to watch out that your Epson L800 printer is new or old series because some reasons, if your Epson L800 printer is new printer, you don’t need to worry about the waste ink after resetting procedure. However, your Epson L800 printer’s Waste Ink Counter needs to be cleaned up the waste ink after resetting because the waste ink can be overflowed and affect to the other components of printer or make your Epson L800 printer’s table dirty. 1. What is Epson L800 waste ink counter overflow? Waste Ink Pads are some porous pads in the printer that collect, distribute, and also very importantly contain the ink which is not used on printed pages (Waste Ink). Even while printhead cleaning process ink flush through printhead to waste ink pad. Therefore once it can be overflowed because it cannot absorb ink anymore and then the ink will leak from the bottom of the printer. The inkjet printer counts how many ink flow to waste ink pad and then keeps this number into printer’s memory ==> This number is called Waste Ink Counter. + Therefore to stop ink leaking outside the Epson L800 inkjet printer the waste ink counter may be overflowed and Epson L800 printer will stop. 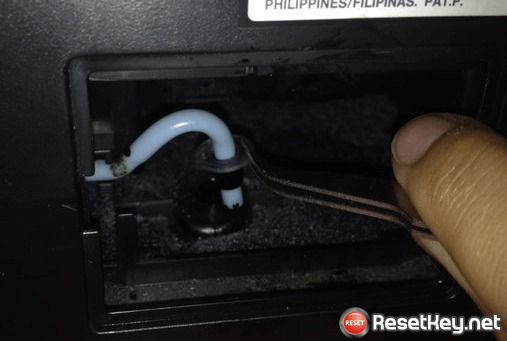 To get Epson L800 printer working again – You need to RESET the Epson L800 printer Waste Ink Counter (Read more to learn how to reset epson printer). 2. 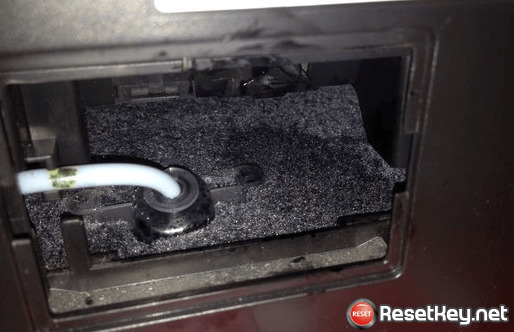 How to know that your Epson L800 printer waste ink counter overflow? 3. How to fix Epson L800 waste ink counter overflow? + Connect your Epson L800 to computer that you installed WIC reset tool. Connect your computer to Internet. 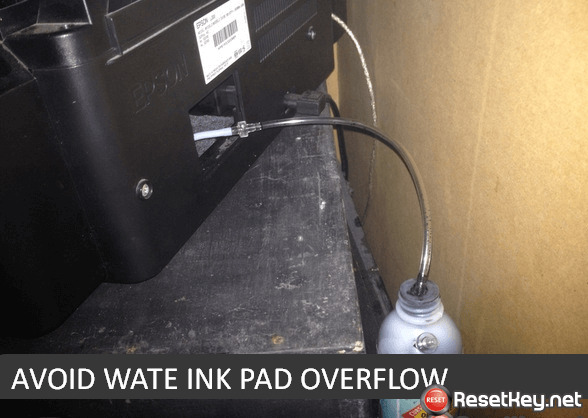 How to avoid Epson L800 printer Waste Ink Pad overflow? You completely use these skills to sop the Epson L800 printer from meeting the problem called Waste Ink Counter Overflow after implementing resetting process. Each Epson printer is designed to have different Waste Ink Pad’s position so let’s read this text carefully to know more. Before starting with the detail steps we need to find some information about the ideas: As we know that the waste ink of the printer is constructed to flow into a wire pine to the Waste Ink Pad then they are collected by the sponge in the Waste Ink Pad, this make the waste ink not to overflow out of the Epson L800 printer but the sponge has the limited absorbing ability so when the sponge is not able to absorb the waste ink, it’ll overflow. You can use a bottle to contain the waste ink instead of replacing the Epson L800 printer’s Waste Ink Pad or collect the waste ink from the Waste Ink Pad. Turn the Epson L800 printer then you can see the small cover as the picture below, this is the waste ink pad’s cover. Then you can realize that the Epson L800 printer’s waste ink pad is larger than the gate to go over the waste ink pad you have already opened when you see. Disassembling the shell and this way needs to be done carefully, you have to take your printer to a service center. When you find the Waste Ink Pad of the Epson L800 printer and the waste ink tube, you can use a tool to separate the waste ink tube iut of the waste ink pad. Please move everything softly and carefully to prevent the damage of the tube. Be gentle and careful to avoid folding or cracking waste ink pipes of Epson L800 printer. 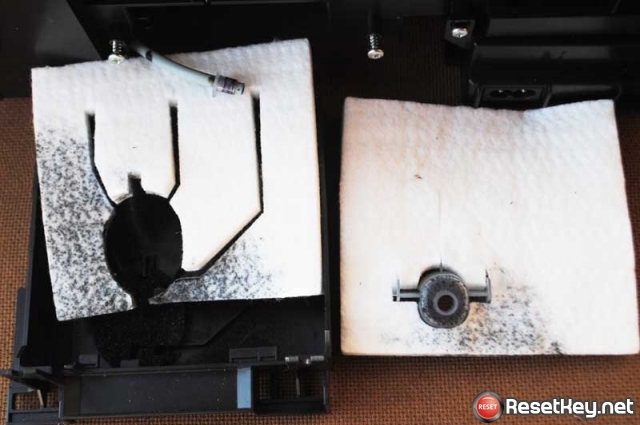 You need to absorb the waste ink from the sponge in the Waste Ink Pad, if your Epson L800 printer is new you can skip this step but if it’s old one, you have to clean the Waste Ink Pad to avoid overflowing waste ink when you move the printer. The waste ink can flow to othe oponents and make them dirty or broken down. Let’s put the tube into the tube of the Epson L800 printer then plug the other into the bottle we have mentioned, don’t forget to put the bottle is lower than your Epson L800 printer to sure that the waste ink can flow easily as the picture below. 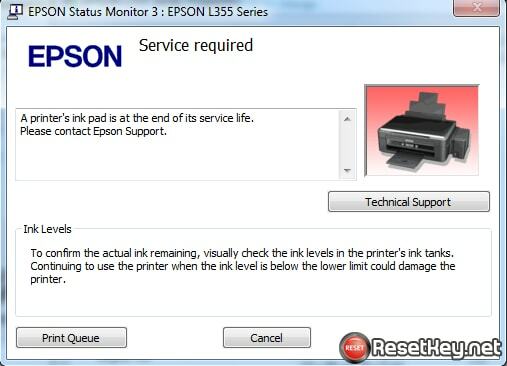 Thanks for your reading post “How to avoid Epson L800 waste ink pad overflow”.